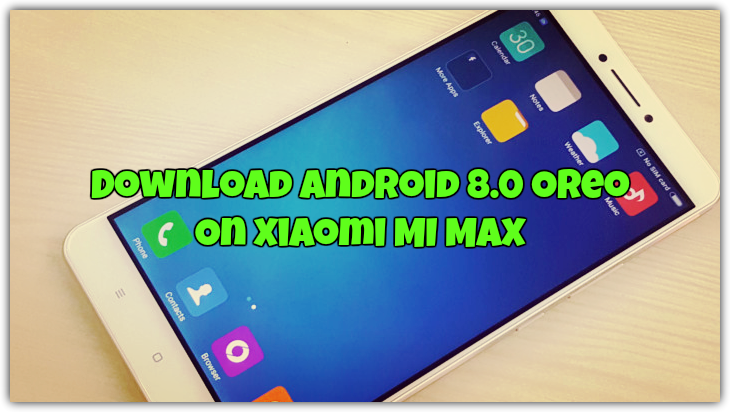 Xiaomi Mi Max received the Android 8.0 Oreo [AOSP 8.0] ROM. Yes, you heard it right, XDA member yshalsager, successfully booted Android 8.0 Oreo on his Mi Max Android Phone. So now you can also Download Android 8.0 Oreo On Xiaomi MI Max. The ROM come s with the pre-built Google apps and you don’t need to install the Gapps zip package with this ROM. The ROM is based on the latest version of the Android 8 Oreo. Recently Google released the OREO for the Pixel and Nexus Phone and some of the developers manage to port that ROM for Other Phones. If You are the MI Max phone user and want to test this Build on your phone, here is the complete guide which you can use on your phone and update the same with Android 8 OREO Custom ROM. This one is the unofficial build and not the stable version. The ROM has some bugs and some app crashed most of the time. To get started all you need MI Max phone with the latest TWRP recovery and have to download the ROM zip file on your phone. The process is simple and only take a few minutes to flash the Android OREO ROM on MI Max. This guide is only for the Mi Max users and don’t follow this method on any other Xiaomi phone otherwise you will brick your phone. Save the zip file on your phone and remeber the location of the ROM. 1. Make sure that your phone is running on the latest version of TWRP recovery. If not then flash the latest TWRP recovery for MI Max here. 2. Download and save the Android 8 ROM zip file on your phone’s internal memory. 3. Boot your phone in recovery mode. Check this guide how to boot the android phone in recovery mode. 4. Once your phone in Recovery Mode. Take the backup of your current ROM. In case you don’t like the ROM, you can easily restore your previous ROM with the Restore Option. 5. Now go back to the main Menu of TWRP and Go to the Wipe > Advanced Wipe and Select System, Data, Cache and Dalvik and Swipe to wipe. 4. Again go back to the home screen of TWRP recovery and Tap on the install option and Locate the OREO ROM zip file and Flash it on your phone. 5. Once the ROM is flashed, Now wipe cache & Dalvik cache again and Reboot your device. That’s it/ now you successfully download the Android 8.0 Oreo On Xiaomi MI Max. Comment below if you have any doubts. We will help you to fix it up. How can possible to install android 8.0 to redmi4 ? ?